Moisture can be found in any material. Even materials considered to be dry have a minor amount of moisture. An imbalance of moisture, whether it be excessive moisture or too little moisture, can cause problems ranging from undesired mold and bacteria growth to cracks and defects. To avoid a moisture imbalance, it is essential to monitor moisture content with a moisture meter that returns accurate and reliable measuring results. A moisture meter can measure the moisture content of everything from the air (relative humidity) to construction and building materials (concrete, wood) to biomass and agricultural products (hay, straw, grain, corn, beans, pellets) to solid waste (pulp, slurry) and beyond. Many moisture meter devices can also measure temperature. The moisture measurement range of each moisture meter varies depending on the model. Some moisture meter products take moisture measurements, store the moisture measurement data to an internal memory or SD cad, and allow the stored moisture measurement data to be transferred to a computer for detailed analysis by means of an evaluation software. 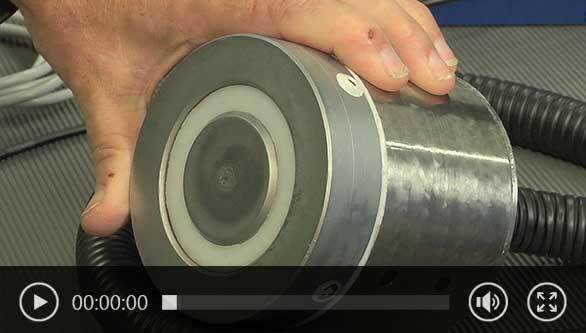 PCE Instruments' moisture meter products come factory calibrated. ISO calibration certificates are available optionally for purchase as accessories to most moisture meter models. An ISO calibration certificate may be important to your company in meeting specific quality standards. For some applications, it plays an important role is moisture is measured with or without contact. Whereas a pin-type moisture meter is perfectly suitable for construction materials, some food regulations may require a non-contact moisture meter. Both types of moisture meters have their advantages and limitations. Also, some applications may require a hand-held moisture or humidity meter and others are easier to realise with a moisture meter or humidity meter for fixed installation. Both types are available at PCE Instruments. The moisture meter PCE-VDL 16I from PCE Instruments measures and stores the relevant measured variables: temperature, relative humidity, air pressure, light as well as acceleration in three axes by means of a vibration sensor. Therefore, this moisture meter is ideal for monitoring vibrations on machines while simultaneously measuring and recording the relevant environmental conditions of the system. The moisture meter PCE-HT 50 is suitable for continuous monitoring of the room climate. This is how the moisture meter finds its application in homes or at work. The moisture meter has an internal sensor for air temperature and humidity. The PCE-BTH 10 is a compact and easy-to-use Bluetooth moisture meter. This Bluetooth moisture meter is characterized by its simple one-button operation and integrated interface. The Bluetooth moisture meter PCE-BTH 10 measures the air temperature and humidity. PCE-SMM 1 is a soil moisture meter ideal for use in agriculture, crop science, horticulture, botany, landscaping, gardening and environmental testing applications. This portable handheld moisture meter or analyzer measures soil moisture or humidity quickly, easily and accurately. The moisture meter PCE-RCM 15 is specially designed to monitor the quality of indoor air. Among other things, the moisture meter measures the parameters for PM1, PM2.5, PM10, TVOC, formaldehyde, humidity and temperature. The moisture meter PCE-RCM 11 serves as an indicative test of environmental parameters. The moisture meter PCE-RCM 11 enables the measurement of fine dust, temperature and relative humidity. The bright display of the moisture meter provides information about the already mentioned parameters. The moisture meter PCE-AQD 10 is used to measure air quality. The moisture meter PCE-AQD measures 10 carbon dioxide, temperature and humidity. The CO2 sensor from the moisture meter is disconnected from the main unit with a connection cable. PCE-W3 is a waste paper moisture meter designed for professional use in the input control of large amounts of waste paper or containers of paper. The waste paper moisture meter can detect absolute moisture in waste paper in order to determine the exact moisture content in the collection center or the paper plant. The moisture meter records humidity and air temperature and stores it internally. This compact and robust moisture meter in mini format and with a large memory (up to a maximum of 32,000 values ​​/ 16,000 values ​​per parameter) is mainly used for long-term registration (refrigerated counters in department stores, refrigerated transport, warehouses, PC climate chambers). The hay moisture meter PCE-HMM is a professional device to designed to determine moisture and temperature of pressed hay and straw. The hay moisture meter features a sensor made of stainless steel, which can be purchased in four different lengths, while the wooden handle has an ergonomic design. The hay moisture meter PCE-HMM proves to be extremely robust, designed to withstand applications for many years. 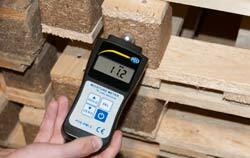 PCE-MMK 1 is a portable handheld digital moisture meter used to measure the moisture content of wood, paper, textiles, concrete and other building materials. This multifunction moisture meter also measures ambient temperature and ambient relative humidity. PCE-WMH-3 is a portable handheld digital wood moisture meter or analyzer used to measure the moisture content of wood. This hammer-style wood moisture analyzer features preset characteristic curves for measuring moisture in 270 different wood types. PCE-WP24 is a wood moisture meter used to perform noninvasive, nondestructive moisture measurements of wood, timber and other construction or building materials. An ideal tool for assessing everything from lumber to floors and more, this moisture meter uses electromagnetic waves that penetrate approximately 50 mm / 1.96 inches to 60 mm / 2.36 inches deep (depending on substrate) to return a mean-value moisture content percentage. The pellets moisture meter PCE-PEL 20 was designed in collaboration with biomass power plant operators. Since the heating value of pellets depends strongly on its moisture the pellets moisture meter ensures high efficiency. The pellets moisture Analyzer performs a resistance moisture detection. Before a moisture meter is purchased it has to be checked what you want to measure. Is it humidity (air moisture) or moisture (material moisture)? Humidity meters are used to measure the humidity in the environment. Humidity meters for this application are available in different constructions and designs depending of the field of use. There are humidity meters with memory like our PCE-313A or the PCE-HT 110. Also handheld devise without memory like our PCE-555 are available. For accurate use in the research field or for calibration our PCE-330 is used. Beyond this some devices have the ability to attach more sensors or they come direct as a pyrometer. Furthermore to our handheld devices for temporary use you can find moisture meters or moisture sensors for steady use. These sensors forward the result via BUS or standard electrical signal to a data logger or process control system. Moisture sensors with this construction are often mounted on a wall. The target of these sensors is it to check the climate conditions in a warehouse for example. For numerous moisture meters different filters for the protection of the sensor are available. For example we have a sinter filter what lets the humidity passes through, but it does not let any water through so the lifetime of the sensor is longer. Although we have a PTFE filter what protects the sensor from chemical contamination. For industry use we have a moisture sensors for custom application available that comes with heated sensor elements, which protects the sensor in a high humidity area, what makes them suitable for this. Moisture meters for abs. moisture respectively material moisture for materials distinguish from a humidity meter that the moisture meter is calibrated (or adjusted) to a certain material. That means that the user has the ability to measure the moisture of a certain material precise. Moisture sensors for material moisture differ in the measurement principle and because of that also in the field of use. A very common measurement method is the resistance method. This measuring method works destructive. In the field it means that, for example, two nails are inserted in the material and between the two needles the electrical resistance is measured. In the device itself the result will be converted through a conversion chart to the real moisture content and it will be displayed in %. Another measuring method, in the field of handheld moisture meters, is the capacitive measuring method. This method is nondestructive. The moisture sensor creates an electric field via two contacts and measures the capacity. As more moisture is present the higher is the capacity. The moisture meter will give a result direct in %. The above descript measuring methods are used in the field of construction moisture measurement with moisture meters. If you want to measure the moisture of bulk material, like plastic granulate or food, the above measuring methods cannot be used. For this you can get moisture meters, with a long sword, where a sensor for rel. humidity is attached to. Through internal calibration characteristic curves the meter calculates the rel. humidity into material moisture. This measurement is preformed through the equilibrium moisture content (EMC). Furthermore the measured values can be stored. Especially for companies, where the environmental conditions must be recorded, an installed moisture meter with data logger is important. Such a moisture meter gives the user next to the visualization of the values the ability for a complete documentation of the conditions in the warehouse. The measurements can be transferred into Excel, csv, etc. after they have been saved. All moisture meters come factory calibrated. But as a moisture sensor tend to drift with time, they should be re-calibrated continuous, to measure the exact moisture content. You can re-calibrate the moisture meter with the optional calibration tools and standards or send the moisture meter to us or a calibration laboratory for ISO calibration. In the following, you can see a picture of a PCE humidity meter in use. 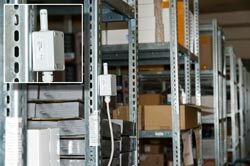 The picture on the right shows one of the humidity meters during long-time recording of the climate in a warehouse (moisture meter sensor attached to a rack). Information on relative humidity: The relative humidity (RH) indicates the relation between the absolute (real) moisture and the saturation amount. The relative air humidity is measured with a humidity meter which is equipped with a display that shows values, for example, between 0 % (absolutely dry air) and 100 % (completely saturated air like fog, clouds or air in a vapour bath). This measurement does not apply to all humidity meters. In some cases, the measurement range is restricted. The physiological comfort zone ranges from 40... 65% rh. As warm air takes on more water vapour than cold air, humans tend to perceive the air as dry in the winter and as sultry in summer. If the air is warm, the amount of water vapour it would contain if it was saturated is increased. This decreases the percentage of relative humidity, even if the real amount of water remains constant. Similarly, cooler air decreases the amount of water vapour which increases the percentage of RH. Condensate generates if there is excess water in saturated ambient air. Some of our humidity meters can also calculate the dew point or dew point temperature in addition to measuring the relative humidity and temperature. The dew point temperature is defined as the temperature at which the current water vapour content in the air is the maximum (100 %) relative air humidity. Thus, the dew point temperature is a parameter that does not depend on the current temperature. One possibility to measure the dew point temperature is cooling down metal until the surface is covered with water vapour. The temperature of the metal at that time represents the dew point temperature. As mentioned before, many of our humidity meters show the dew point directly on the display. Compressed air systems have been used in a wide range of technology fields including welding, heat treatment, cutting, forging, and transportation. Continuous monitoring of the systems condition allows for correct operation within production processes or where it is necessary to automate equipment and machinery. During the preparation process, large volumes of atmospheric air are introduced into the filtration system, filtering out various harmful particles including oil, moisture, combustion residue, and dust that are considered harmful to the pneumatic systems. However, the filter is designed with a minimum size limit allowing tiny particles such as moisture to pass through into the system. This convenient and user-friendly pneumatic system can become damaged should moisture begin to condense inside of the system. As the temperature decreases, the amount of condensed moisture in the air begins to increase and over time may reach its saturated condition with a relative humidity of 100%, where the dew point has reached equal temperature. As the temperature increases, the opposite occurs. For this reason, systems may contain different values, as well as different amounts of condensation in the compressed air. A common factor among the different systems is the hindrance of moisture accumulation within a pneumatic system, as this is why all of the excessive moisture must be removed from the pneumatic system at different stages. Varying amounts of moisture in the system can cause corrosion inside the pipe lines, contamination of the compressed air due to a mix of moisture and oil particles, excessive wear on the system components, and deterioration of final product quality. Because of this, it is absolutely prohibited in manufacturing involving foodstuffs, beverages, medical supplies, and electronic equipment, however, there are some instances within the industrial branches where permissible levels are allowed. Despite this fact, strict monitoring and compliance with the standards are required.